Plumping up cheeks, smoothing out lines, and getting rid of a double chin are just a few of the ways cosmetic injectables can help rejuvenate your appearance. Jason T. Arrington, MD, of Atlantic Plastic Surgery, is a board-certified plastic surgeon who provides a variety of cosmetic injectables and fillers to women and men who want to fight back against the signs of aging. With locations in Salisbury and Ocean City, Maryland, and a caring, knowledgeable team, it’s easy to get the best injectable treatments in the area. Call or click to schedule an appointment at either location. Cosmetic injectables perform a variety of different ways to help give you a more youthful appearance. 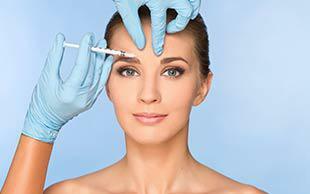 Some injectables fill in lines and plump up areas of your face that are not as youthful as they used to be. Others make your lips look fuller, and some help relax the facial muscles that cause wrinkles. Juvéderm contains hyaluronic acid, a substance that naturally occurs in your body. It helps your skin retain moisture and adds volume. As you age, and you produce less hyaluronic acid, your face can appear less firm and less elastic. Juvéderm is an injectable gel that contains hyaluronic acid, so it helps correct age-related volume loss in your facial tissue. In addition to plumping and lifting your cheeks, the Juvéderm family of injectable gels can correct moderate to severe wrinkles and nasolabial folds. It can also smooth fine lines around your lips and make your lips appear fuller. Kybella is the only FDA-approved injectable treatment that specifically targets and destroys fat under your chin. Kybella’s active ingredient is a synthetic form deoxycholic acid, which is a naturally occurring molecule within your body that helps break down fat. When Dr. Arrington injects Kybella into the area under your chin, it destroys the fat cells. You may need a series of injections over a period of a few months, and Dr. Arrington advises you on the best course of treatment for your individual goals. Once fat cells are destroyed, they’re gone for good, so once you reach your desired results with Kybella, you won’t need additional treatments. If you’d like to learn more about injectable options like Juvéderm, Kybella, and Botox, call either office to schedule a consultation or use the online booking system.